Following my earlier appeal, John Brimm has been looking carefully at these two photos. Firstly he suggests that they were taken on the same day and the same people are in both photos. He thinks the "outdoor" photo was taken in the garden of the Castle Inn and has spotted the N of Inn on the upper storey of the building. The indoor photo was more than likely taken in the Victoria Hall. Clues here are the hand pumps on the bar and the potable film screen at the back of the hall. 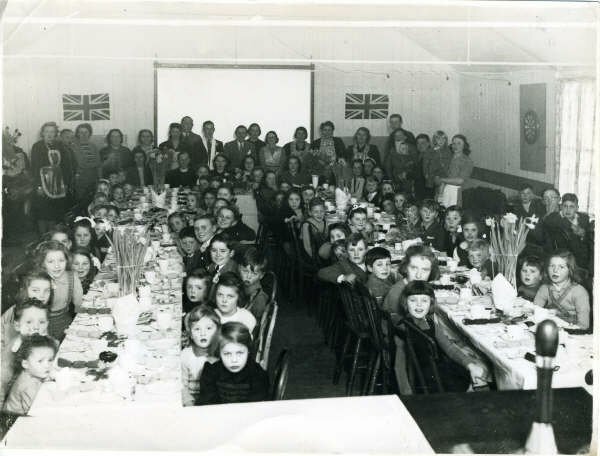 John has also been looking at the table decorations and noted the daffodils suggesting it was taken early in the year but why the union flags on the wall?